I had ordered both because I thought that the Color Display kit is needs the other kit as a base. Well, it turned out that both kits work independently. My bad. 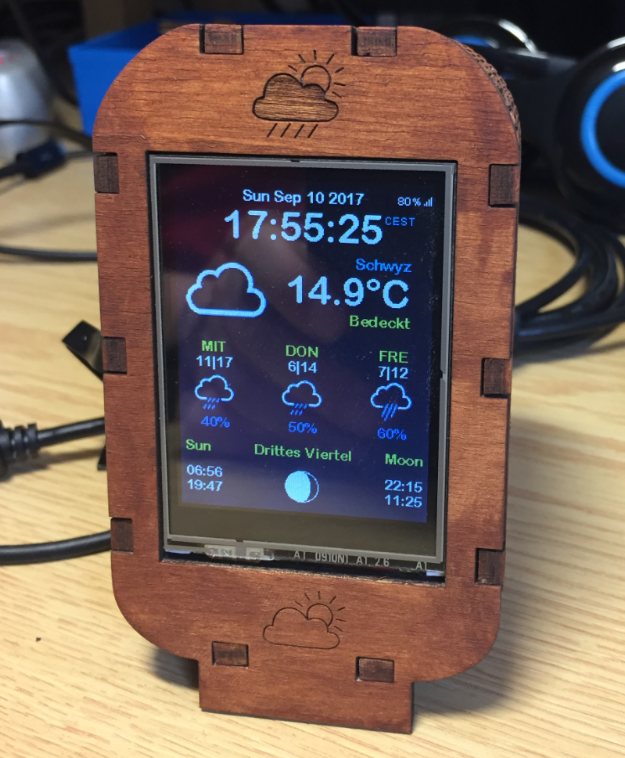 Actually this is good, as I have now two independent ESP8266 weather stations :-). An addition to that, they can exchange data (e.g. 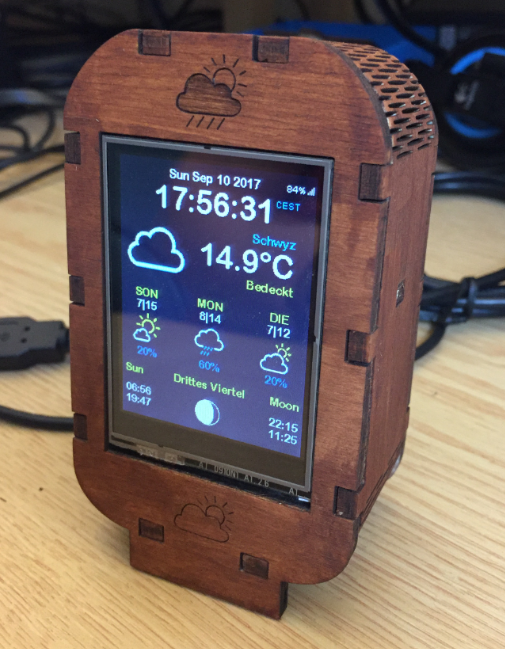 temperature/humidity) with a server, so that makes them a perfect dual weather station. 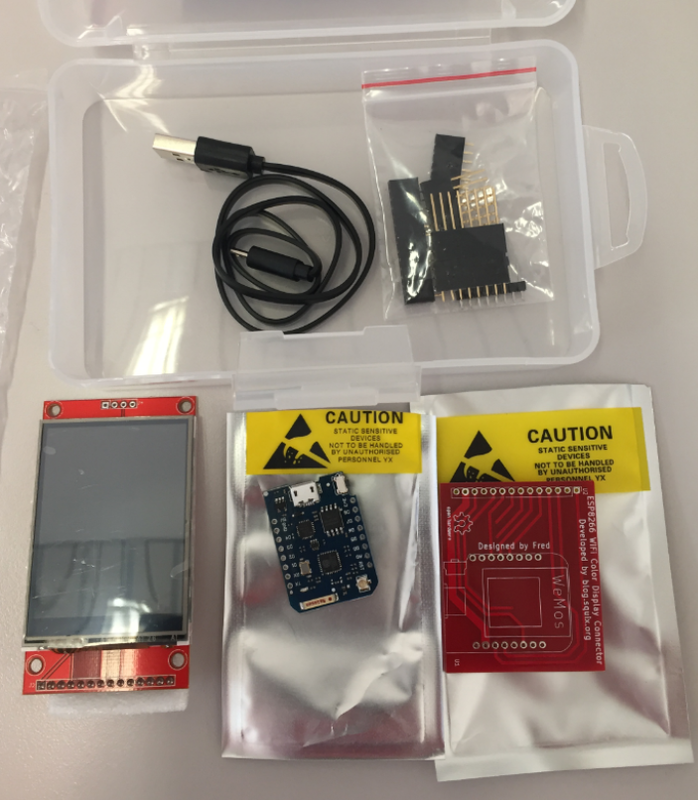 This time assembling the kit needs basic soldering skills. 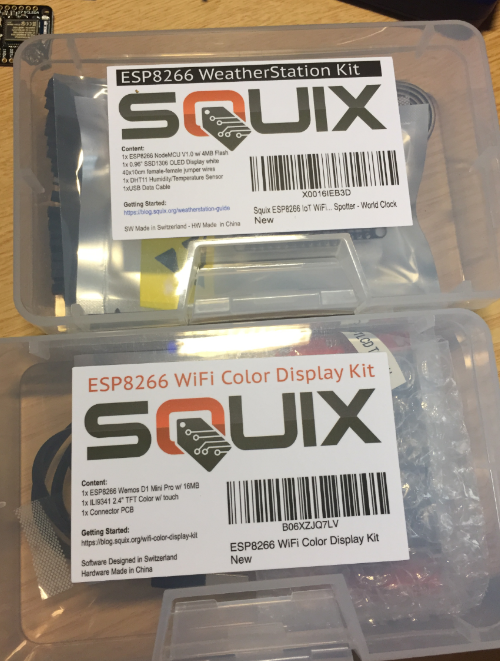 With the excellent tutorial by Daniel Eichhorn (https://blog.squix.org/wifi-color-display-kit) this should be a piece of cake. The only consideration is what kind of headers to use. I opted for the ‘larger but flexible’ approach. That way I can separate the boards if needed. The example code pretty much works the same way as for the smaller OLED station, but it uses the touch display to show the data. 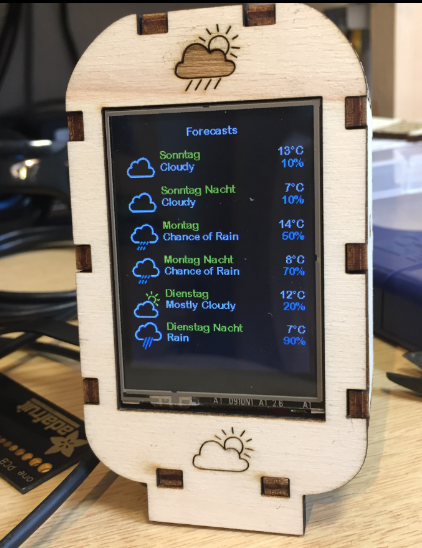 After a few hours, I have now my second ESP8266 WiFi weather station with touch LCD. It is not looking good and I very much enjoy it. 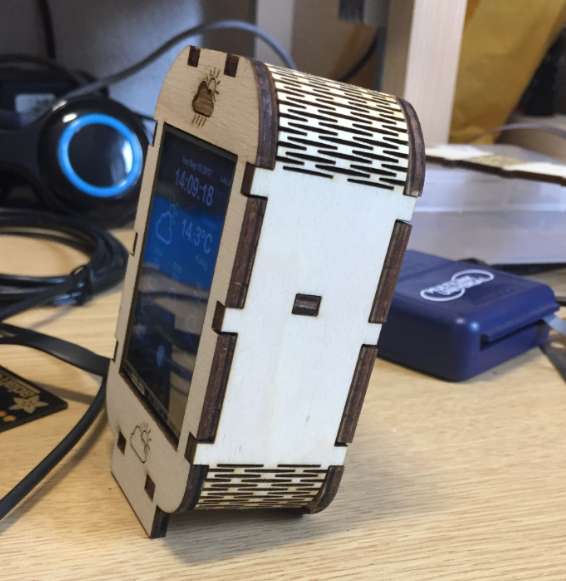 The design is available on Thingiverse (https://www.thingiverse.com/thing:2527282). Thanks go to Daniel Eichhorn for making that kit available and documenting it so well! 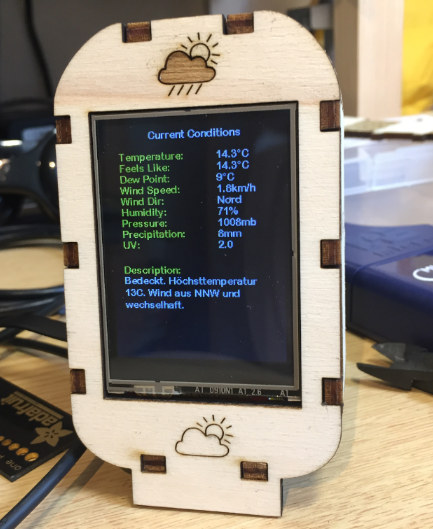 This entry was posted in Boards, Embedded, Laser, Laser Cutter, Wood and tagged Enclosure, ESP8266, Inkscape, Laser, Laser Cutter, LCD, open source projects, SQUIX, technology, TFT, Touch LCD, Weather Data, Weather Station, WiFi by Erich Styger. Bookmark the permalink. 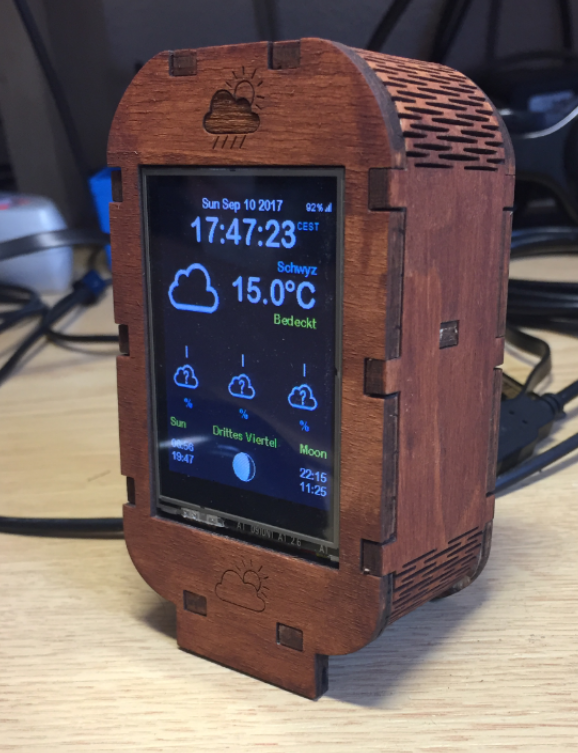 I’m loving the side panels for your enclosure, using the vents slots so they can curve — nice touch! How do you make those curves conform to the curves of the front and rear panels? Hot melt glue and luck? The enclosure does not need any glue or screws: it is kept in place with the special side constructure. The curves is a technique called ‘kerf bending’ (see https://stusshed.com/2007/07/17/kerfing-bending-wood-on-the-tablesaw/ and https://github.com/vanillabox/OpenSCADBoxes and http://www.gedankensuppe.de/kerf-bending-patterns). 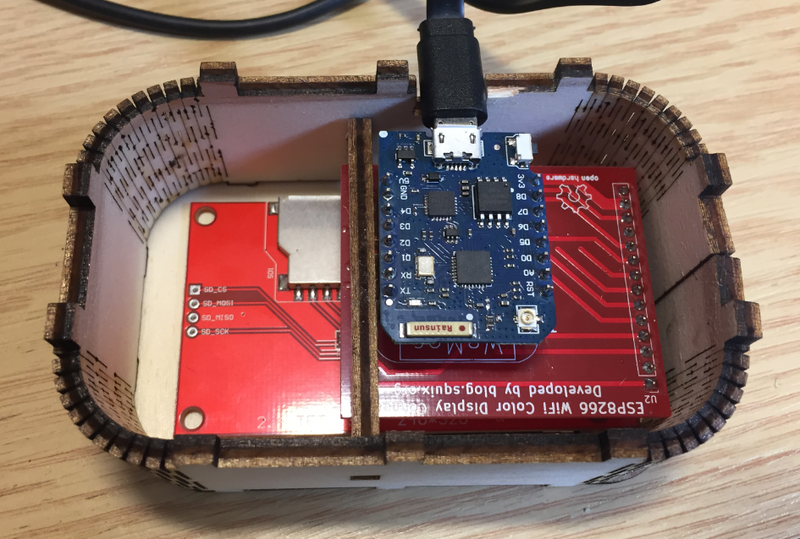 Would there be another type of material that could be used to make the enclosure other than plywood? Perhaps something with UL 94-V0 flammability rating ? PMMA is another material I use (https://en.wikipedia.org/wiki/Poly(methyl_methacrylate)), but I think that would not stand a UL94-V0 test? 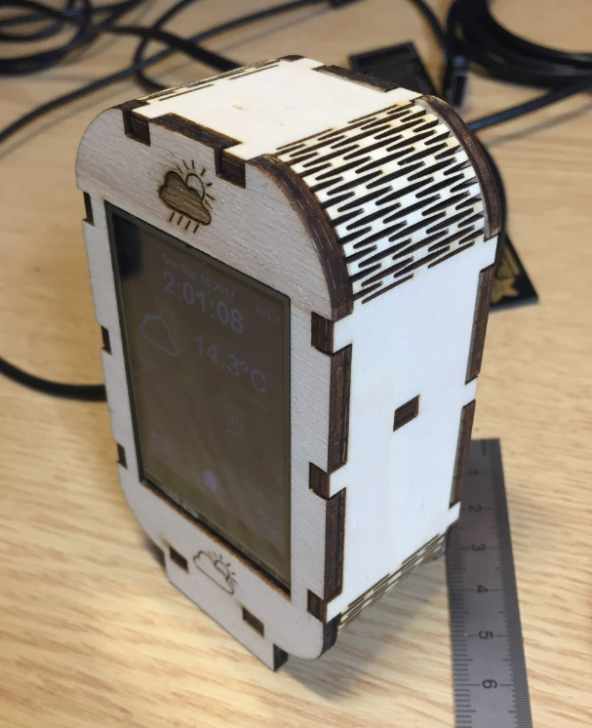 I’m sure there might be other materials, but with a laser cutter one has to be careful about not using materials which could create a health issue (e.g. PVC would be such a problematic thing). That’s why usually only plywood, PMMA or (real) leather or paper/cardboxes are used in a low power laser cutters. Of course with high power laser cutter you could cut metal sheets. Very nice Case. Thats is what i Search. Can i order this everywhere? but I think it’s make with a Laser. Yes, this one is made with a laser cutter. 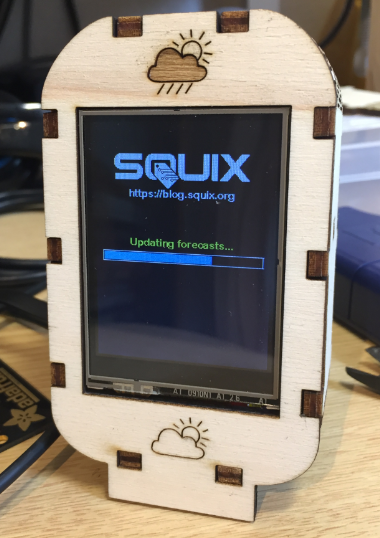 The one in https://mcuoneclipse.com/2017/10/22/squix-esp8266-based-e-paper-weather-station/ is created with a 3D printer. Yes, I think that was the first question of mine. I love this case and want to have it. or can I make it with the files I downloaded at a company the do this? 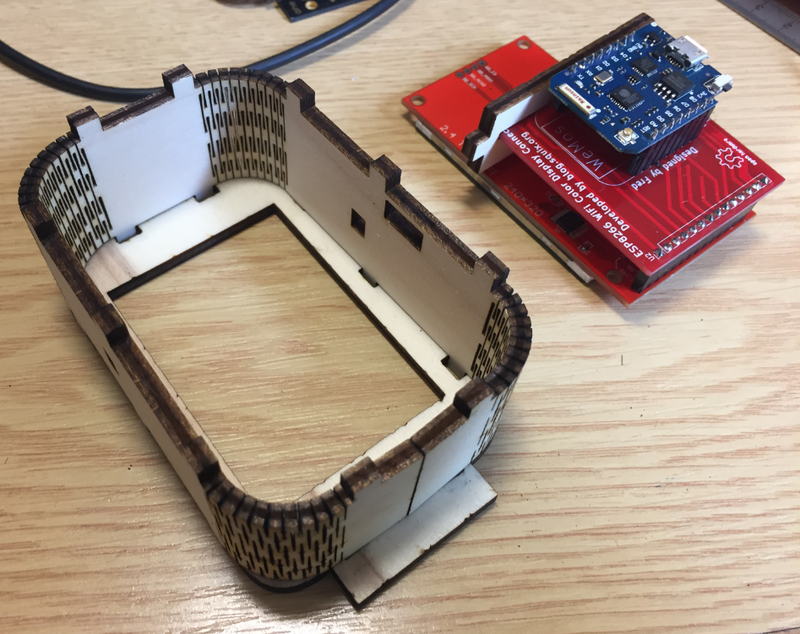 Are the files for a laser cutter available? 3DHubs are specialied for 3D printing, not laser cutting. Not sure if a similar service exists, but maybe you find a maker space nearby? 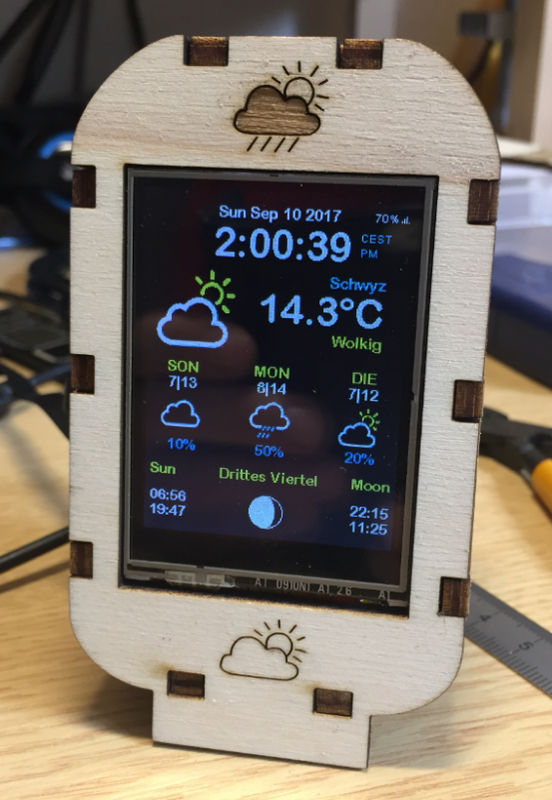 The laser cutter files are listed on thingverse (see link at the end of this article. Excellent! Is it possible to use LCD screen without touch? Yes. Well, then you don’t have the touch functionality. Touch is used to cycle between different views, so you could cycle through the displays without the touch functionality, e.g. at a fixed rate or using a push button. Erich, Thanks for making this available! 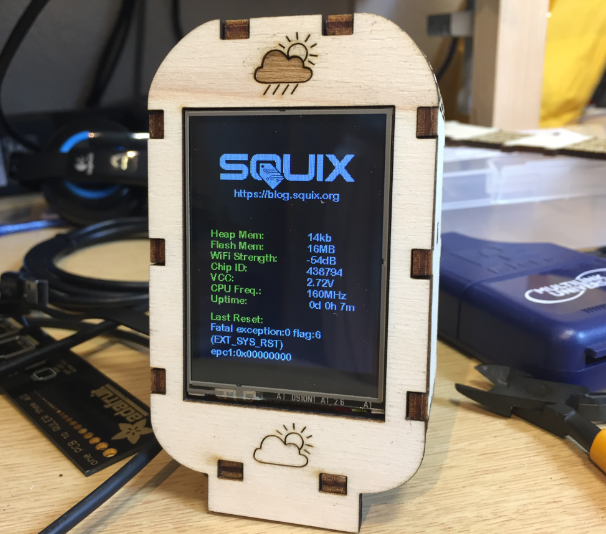 I have assembled my SQUIX kit as well, but it is much thinner than yours, about 0.3″ from the back of the faceplate to the back of the top PCB. I’m able to reuse your front and back, but I’ll have to change the kerf-wrap. A few questions, if you don’t mind: How did you design the outline? 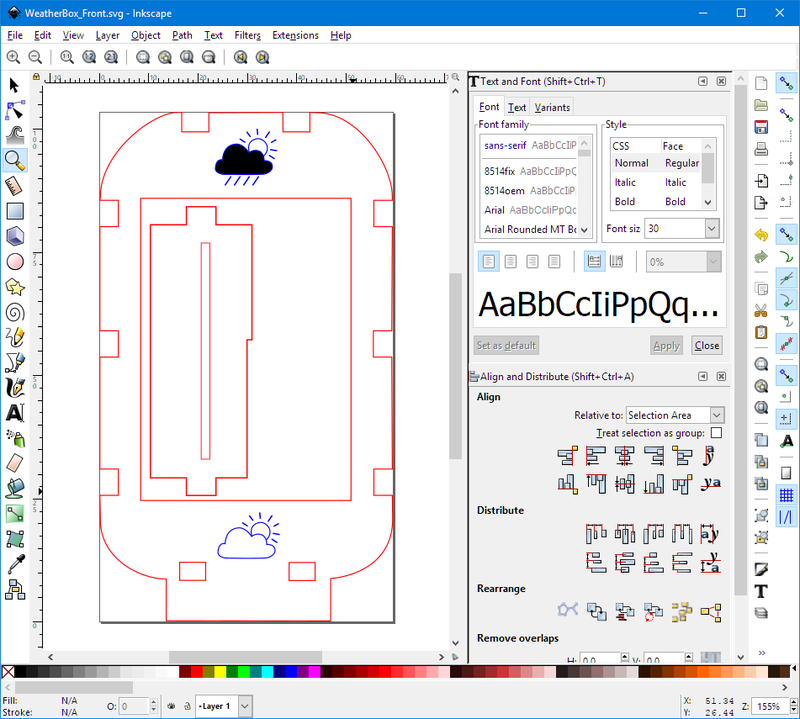 In inkscape, I can move the kerf cuts, but the outline is fixed, which means I cannot make it narrower. Is there some easy way to turn it back into lines? Also, how did you calculate the length for all of the segments? 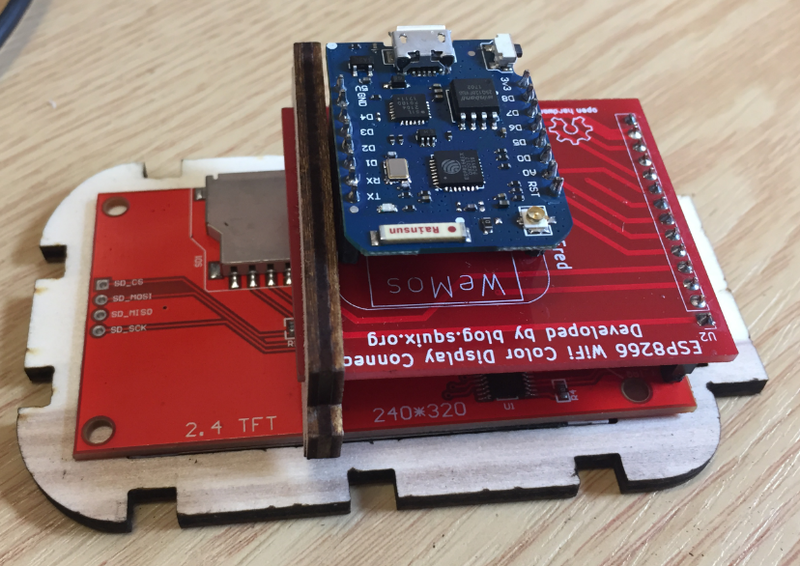 I have used headers for my PCB assembly, so this might add to the thickness change you see. You can move the outline in Inkscape: make sure you have it ungrouped first (select, Object > Ungroup). I did not calculate the length of the segments, it was simply trial-and-error (took me 3 iterations, so not that bad).